In this section we will discuss the Robonomics Network scenario. Robonomics Network uses IPFS PubSub channels for messaging. There are three types of messages: Demand, Offer, Result. An Offer message has the same fields but instead of validatorFee there is a lighthouseFee field. This field determines the amount of fee for a lighthouse. 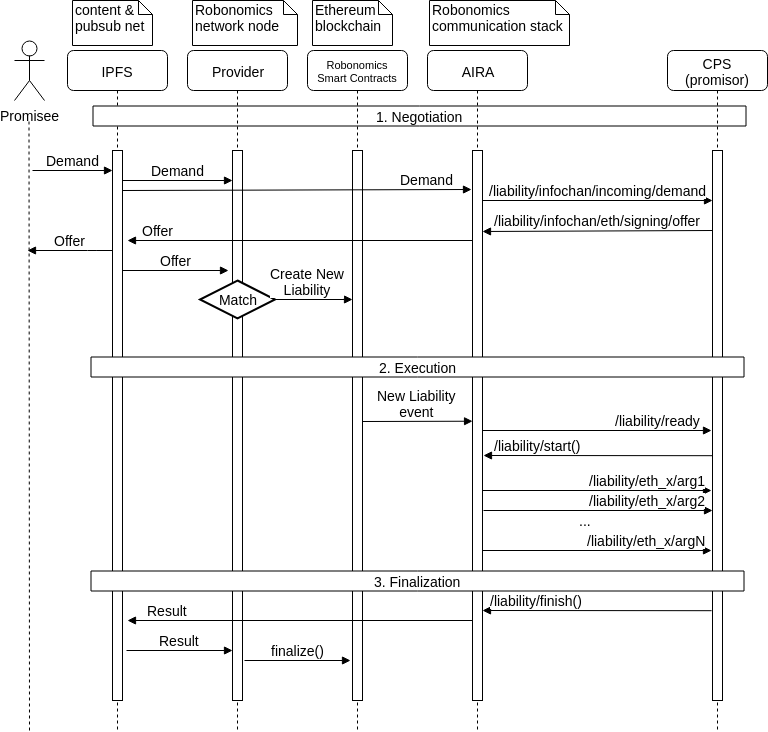 Now let’s have a look at the following diagram and walk step by step from the moment of publishing messages to a liability finalization. A liability contract is created only if the following fields match: model, objective, token, cost. A provider of Robonomics Network watches every message and finds those ones that have a match. After the match is found the provider calls createLiability(demand, offer) method from the contract factory where demand and offer are serialized. The factory deserializes arguments and recovers promisee and promisor addresses from signatures. Next step is token transfer. The factory transfers cost tokens from the promisee address and validatorFee and lighthouseFee from the promisor address to the new liability address. You should approve sufficient amount of tokens for the factory. It’s not required to approve tokens from the promisor address if fees are null. Now the factory emits a NewLiability event with the liability address. An agent gets the address, reads fields, perform a task and at the same time writes a log file in rosbag format. When the work is done the agent sends a Result message with the following fields: hash of the rosbag file, a success flag, a signature. If the validator field is not null it means that only validator is able to finalize the liability. After the successful liability finalization the agent gets cost tokens. Otherwise, the promisee gets tokens back.